Welcome back to our Animal Care (Husbandry) Blog! As we are in the middle of our winter months, we thought we would give you bit of an insight to our routine on the farm. In the winter, alpacas need a little bit of an extra dose of vitamins! Rickets - primarily in young alpacas. 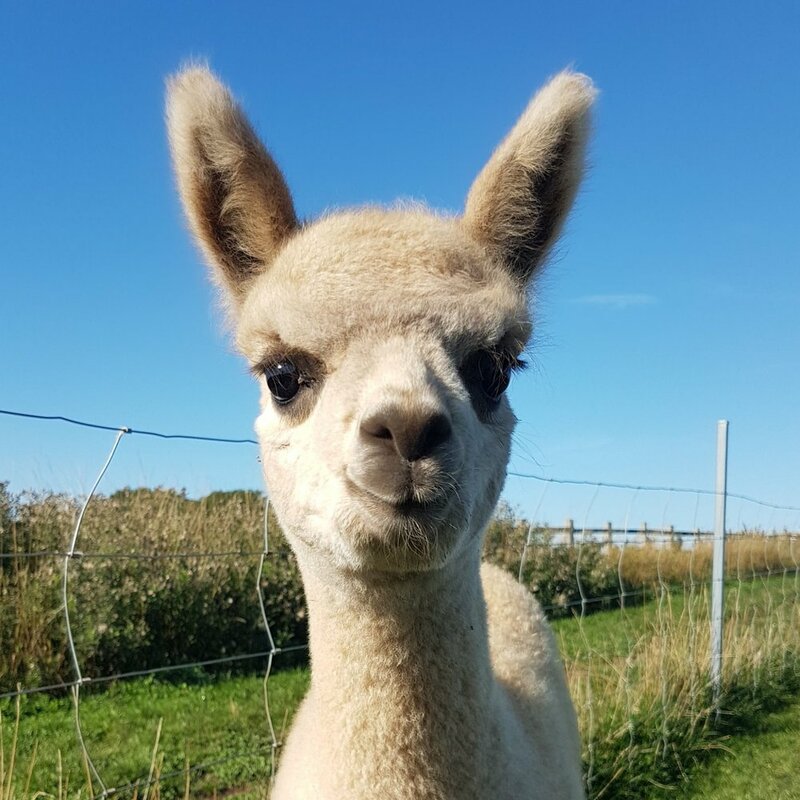 Rickets is very common in the UK and can affect young alpacas mostly in their first year of life, however it has been known to affect adult alpacas too. One of the first signs of rickets in alpacas is lameness which leads on to significant weight loss. Rickets leads to bowed legs and swelling or bending of the joints - which can be very painful to live with. While alpacas are young, their bones are still growing… With a Vitamin D deficiency, young alpacas or cria can easily develop rickets while they grow. They have plenty of plants and grass around to eat, however they are still not getting the sufficient amount of Vitamin D.
Fleece loss - in darker coloured alpacas. Fleece loss can also occur in alpacas due to vitamin deficiency. However this occurs in the darker coloured alpacas because their darker skin pigmentation doesn’t allow as much sunlight in as the lighter coloured alpacas do. This will cause a reduction in the amount of Vitamins they can get and as a result, they will lose fleece in various areas. On our farm, from October to February, the whole herd gets a dosage of Vitamin AD&E which gives them a boost of vitamins while they don’t get enough from the sun. Our herd gets their AD&E through an injection, but it can also be given as an oral paste. Also, in November and March, our herd gets a dosage of Camelid Drench, which is taken orally which is full of a number of different vitamins, which again boosts them over the colder months. Our cria are growing up... It's weaning time! This month is always very exciting because it’s when we start to wean our not-so-little cria! We started our halter training a little early, and you can keep yourself up to date with their progress on our Instagram Highlights here! We have decided to do a Q&A for weaning because we get a lot of questions about the subject, so have a little look at the journey our little ones go through to become independent little grown ups! Why do you wean them? Do they eat more food? Do they need any extra supplements? How do the mums cope? Do they ever get reunited? What is halter training, why do you do it? How do you halter train, how long does it take? “The method we use to halter train is the pull and release technique. This is as simple as it sounds. When we pull on the rope, the alpaca will step forward, so we will then release the rope. Eventually this teaches the alpaca that we will not pull if they walk. Of course, when first starting out, we simply put a halter on so that they can get used to the feeling of it on their face. Welcome to the Animal Care (Husbandry) Blog! This month we are going to be discussing top-knot trimming, some of our girls and boys needed a haircut over the past few weeks and we decided to get some before and after shots! On our farm, we have over 150 alpacas, and not a single one has the same hairstyle (although we do have a few that are very similar) which means that they all need their top knots cut at different times. This past week, we have been looking at our stud boys because many of their topknots are very thick. While some of our pet boys, and some of our females too have quite short topknots, or high hairlines! You can see the difference in hairstyles below. With Lucinda and her voluminous topknot on the left, and Sunshine on the left with quite a high hairline. Throughout the year, we look at each of our field groups (females, studs, pets and maternity) and we make sure to keep on top of all of their topknots. This is because if they get too long, they can’t see, and also their eyes can be at risk of infection. As you can see above, Lucinda has got a very dense topknot but this simply means she gets hers trimmed more often than perhaps Sunshine would. Many of our stud boys have a lot of fleece on their cheeks as well as on their head, and this can have the same affect as their topknot if it becomes too long, so occasionally we will give them a trim on their cheeks, because our boys need to be handsome but need to see the world too! There are many different ways that people “style” their alpacas. During shearing, alpacas tend to have their whole fleece taken off, and many would leave the topknots (and some tails). While other people take a more creative approach to their alpacas appearance. As you can see below, some people will take all the fleece - including those topknots - off and leave nothing, while others may choose to keep the tails, or even the trousers!! Many breeders will only shear their alpacas up to the necks, and leave their whole head fluffy! On the other hand, there are a number of people out there that prefer to be a little more original, as opposed to traditional when giving their alpacas that all important yearly makeover! Some go for stripes, or waves, or even dinosaurs!! On our farm, we shear our alpacas up to the topknots, simply because we prefer to use their fleece positively in the way it is intended. Once we have sheared the alpacas, we send a lot of the fleece off to the mills, but we also have a number of superstars on our farm, and their fleece gets sent off to the shows! The different hairstyles has started quite a debate, some people prefer traditional shearing patterns, some people think its cruel or wasteful of the fleece, while there are many other people think that the creativity is fantastic! What are your opinions? Traditional or Creative? First of all, welcome to our Husbandry page, where each month we will be giving you an insight into what different things we do on the farm in order to take good care of our animals! This month, we will be giving you a step by step guide to cutting toenails. This is something that we must do every two months or so and it can take us a quite a while because it means cutting 8 toe nails per alpaca, and we've got 150 plus alpacas on the farm - that's a lot of toenails to trim!! An interesting fact is that our white alpacas often need a trim more than the darker fleeced animals. Not all alpacas willingly stand totally still and allow you to start trimming their nails. So the alpaca needs to be haltered up and kept still, this can be achieved by either having a second person to hold the alpaca, or simply having the lead tied to a sturdy gate or fence, this just keeps the alpaca in one place for you! When catching any alpaca, it is most important that you remain calm, smooth and slow when approaching, this prevents the alpaca from stressing or becoming frightened. You must always remember to keep your arms open "like a fence" as we would say. Then once you are close enough to your alpaca, you can go in for the catch! Again, this must be a smooth movement otherwise your alpaca will become frightened of you and will try to escape. Once alpacas are caught, some may try to pull away from you. At this point, you must remain persistent with your alpaca and hold on while remaining calm until your alpaca calms itself down. Remember, if you are stressed, the alpaca will sense it! Once the alpaca is calm, it must be held correctly. To do this, we have one arm around the alpaca's neck, with the elbow just under the chin to support their head, and the other hand placed on the alpaca's back (just over the shoulders), this can prevent the alpaca from jumping. Lastly, we always make sure that our body is pushed against the alpaca, just so that they know we are here - you are now ready to halter up your alpaca. Once your alpaca is calm, you can put the halter on. First step is to make sure your alpaca’s halter fits properly, to ensure this, you can check how tight the halter is underneath their chin, and also round the back of the head. It is important that the halter fits properly because if it is too small, the noseband can slip forward and restrict the alpaca’s breathing. While if too big, the halter can be loose and your alpaca will challenge it because they can feel it moving. Once you have the correct size, the halter needs to be put on properly… So, while holding your alpaca, have one hand through the noseband and slide the halter on to your alpacas nose. 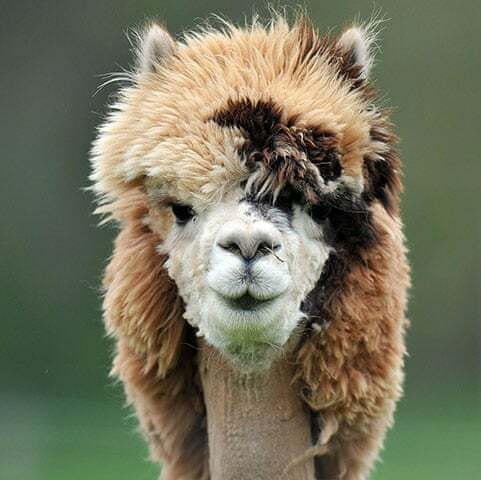 Always make sure that you avoid the eye area because this can frighten the alpaca, so it is best to go from underneath and slip it over the nose. Next step is to fasten your halter, so bring the straps around the back of the neck. Usually, halters fasten with a standard buckle, so thread the strap through the buckle and pull it tight. Always make sure that the halter is as tight as you can get it. We aim to be able to slide one index finger under the strap at the neck. Now that your alpaca is all set and ready for a trim, you need to make sure that you are ready. First thing is to make sure you are wearing gloves. On our farm, we treat our alpacas’ feet with AZ Oil, which is used to treat and prevent mites from developing between their toes so the gloves will protect our hands from the oil as well as dirt. Of course, you will also need your toenail trimmers, and (just in case) have some purple spray or iodine spray at hand to treat any small cuts to the quick. You are now ready to start trimming! First off, start with one of your alpaca’s front feet, always remember to approach your alpaca calmly, while you cut your alpaca’s toenails, face yourself down towards your alpacas back feet. One leg will go underneath your alpaca’s chest (between their legs) so that the alpaca can lean on you if they cannot balance and the other leg will go on the outside, so that you can balance too! Once you have done this you will find yourself in a squatting position. With your hands, start at the top of your alpaca’s leg, guiding your hand down so they they know you are there. Gently pick up your alpaca’s foot and begin cutting. When cutting your alpaca’s nails, always cut in line with their pad. This will prevent you from cutting your alpaca’s toe! Essentially, each toe can be finished in three cuts… The first cut, is along the point of the nail, this will bring the nail down to the length you want it. The second and third cuts will be down the sides, again keeping in line with your alpaca’s pad. Lastly, trim the point of the nail down so that when the alpaca scratches itself, it won’t cause injury. Once you have finished both toes, you are ready to move to the back foot. 5. Now to the back. On the same side as your alpaca, move yourself down the alpaca, still facing the same way, and keep your hands on your alpaca to let them know you’re still there, and you’re moving down their body. Your legs should be in a similar position, with one leg between theirs, supporting them while you trim. When picking up the back foot, it will come up behind them. Try your best to keep the foot as close to the floor as you can, this helps to keep your alpaca relaxed. Once you are in position and your alpaca is calm, you can repeat the same cutting process! 6. And the other side! This step is repeating the above, except on the other side of your alpaca, so simply move around the other side, and begin again. Depending on which side you started with and which is your dominant hand, this side can be a little more complicated when it comes to cutting, but remain calm, and take your time in cutting. 7. Were there any accidents? If you have trimmed your alpaca toe a little too short and there’s a bit of blood, don't panic! It’s a small cut and your alpaca will be fine, just apply a little purple spray or iodine spray. 8. Letting your alpaca go. The last step of toenail trimming is of course letting your alpaca go. Hold your alpaca in the same position as before, with one arm around the neck, and the other on the back. Take your hand off the alpaca’s back, and use this to unhalter your alpaca. Once you are done, calmly let go of your alpaca when you are ready. If your alpaca is pulling you to let them go, hold on to your alpaca until they are calm so you remain in control. Letting them go under your standards will reinforce good manners, and they will begin to feel more comfortable around you.